Under coach Jenny Allard, Crimson players come alive together. The spring before she arrived, the team had gone 18-25 overall, and 4-6 in the Ivy League. Harvard had never won a conference championship. Allard set out to change that. “The freshmen I came in with, I didn’t recruit,” she says. “Those kids were all very talented, and I said, ‘You’re not graduating without an Ivy title.’” They didn’t. In Allard’s first season, Harvard finished second in the conference, with a 28-14 record overall, 9-3 Ivy. Three years later, in 1998, the team went unbeaten in Ivy play and brought home its first championship. Five others have followed, along with six 30-win seasons and five NCAA berths. Harvard softball is now a perennial postseason threat. 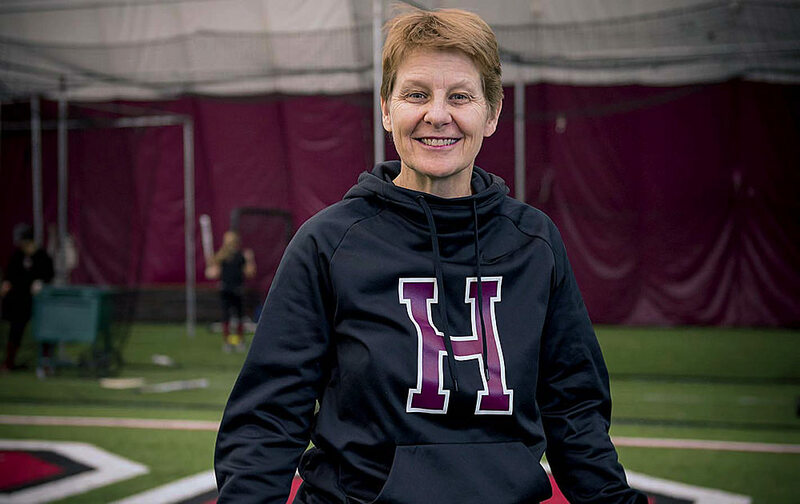 Allard works with her pitchers in the Harvard Stadium Bubble, softball and baseball’s winter practice site. That’s only half the story, though, Allard insists. The other half, harder to define, is wrapped up in the spontaneous road trips that seniors take together during the January term, or the fact that even on their day off from practice and each other, the players can usually be found together. Years after the women graduate, they travel by the dozens to attend each others’ weddings, or parents’ funerals. And it’s also in the fact that, for the third year in a row, Harvard earned one of the top 10 GPAs in the NCAA (3.588, the highest in the Ivies). That achievement began in the locker room, with a goal-setting challenge from Allard (who, with master’s degrees from the School of Education and the Extension School, spent 12 years as a freshman proctor and now is a non-resident adviser). It ended with the players pushing each other forward. This spring, the team expects to be in the Ivy title hunt again. For the first time in a few years, the roster is dominated by upperclassmen (only eight of 29 players are freshmen or sophomores), and seven returning players made All-Ivy honors last season. Among them is lefty hitter Rhianna Rich ’19, who finished second in the conference in 2017 with a .418 batting average and led the league with seven triples. Kaplan, the team’s number two hitter, got 11 extra-base hits last year, and center-fielder Schiffhauer surged late in the season, hitting .545 in the last eight games to help send the team to the Ivy championship series against Princeton, though the Crimson fell short of the title. That image is reminiscent of another that came to mind for Brown. In 2013, one of her teammates married a Harvard swimmer. Something like 35 softball players traveled to attend, from perhaps seven or eight graduating classes. And on the morning of the ceremony, they held a giant slow-pitch softball game, with the bride and groom and all their friends swirling around the field. Reprising her playing-days position, Allard stepped in as the designated pitcher. “And to see Coach in the middle of all this,” Brown says, “and to think, this is something she created. She created this community of women who will be with each other through life.” In that way, they never leave the field.